It was about 20 years ago that I became interested in pedal cars. Initially, it was the Pursuit plane that caught my eye. I had always been interested in anything related to aviation, my training was in industrial design and I had a background in metal stampings. The Pursuit plane pushed all of my buttons, I thought it was such an innovative design, and so unique, that I decided that I had to have one. I began attending collectible toy shows in Toledo, Kalamazoo, Chicago, and Atlantic City, looking for a plane to buy. One of the problems that I soon discovered was that many of the pedal cars and planes were missing parts, and most of these parts were not available. Soon I made the acquaintance of some of the suppliers to the hobby. Guys like J.D. Dorsey, Bob Ellsworth, Bill Smith, Van Eden, and Ron Doan were fabricating replacement parts so that these fascinating old toys could be resuscitated. My good friend, Mike Calverley, owned a sheet metal fabrication company called Mister Metal, and my brother, Ed Kriewall, owned a prototype sheet metal company called Kriewall Enterprises. And as for me, I had a perfectly good pencil and some blank paper to bring to the enterprise. Between the three of us, and with the encouragement of some of the previously mentioned suppliers, who could not make some of the parts that were needed, (some required a press capacity of 650 tons) we decided to go into the pedal car replacement parts business. The business was originally operated as a part of Mister Metal, but after a couple of years we decided to form a separate company, and C & N Reproductions was born (C & N is for Carl and Nancy). One of our first priorities at C & N Reproductions, Inc. was the Pursuit plane, and within a year and a half we had made all new tooling that could make every part of the plane and we began to offer parts to people who had an old plane to restore, and kits to people who could not find one to restore. Business was good, and there was a market for other parts, and soon we were making bumpers, windshields, steering wheels, and other parts for a variety of pedal cars. The reborn Pursuit plane became very popular with collectors, especially the kit version, because now they could build their plane while working with new steel, instead of rust. Our next project was to build a pedal version of the Corsair. We designed the distinctive bent wings and added a round cowl and three bladed prop to give the plane a look of the famous World War II fighter. Unfortunately, both planes were copied by a California company, and produced overseas at a price we could not compete with, so we reluctantly discontinued both versions. The hobby of restoring old pedal cars was growing as people found it to be fun and rewarding. One negative aspect affecting the hobby was the growing scarcity of old cars available to restore. Prices rose rapidly and by the late 90s it was hard to find a restorable pedal car, at least one of the more desirable models, for a thousand dollars. It became common to find cars offered for sale at toy shows for that much and more that were badly rusted and missing many parts. People were being priced out of the hobby. Parents that had enjoyed pedal cars when they were kids were not about to let their kids play with a "toy" that was so expensive. That situation was about to change. At about that time, Mike Burns began importing a pedal car that was made for him in Korea, and selling it for a price that was a fraction of what an original model of the same car would bring. The car was a replica of a Murray Champion, and it was a bargain, and it sold like crazy. The hobby would never be the same again. Soon there were a dozen variations of the Champion, then other people began making reproductions of other pedal cars, then airplanes, wagons, toy trucks, and anything else to get in on the nostalgia craze. Now people were buying pedal cars, not just to put in their rec-rooms, but for their kids to play with. At C & N, we saw our business change from being a supplier of parts, to being a supplier of parts that we made, and cars that other people made. We now stock dozens different models of pedal cars from three manufacturers and more are in the works. 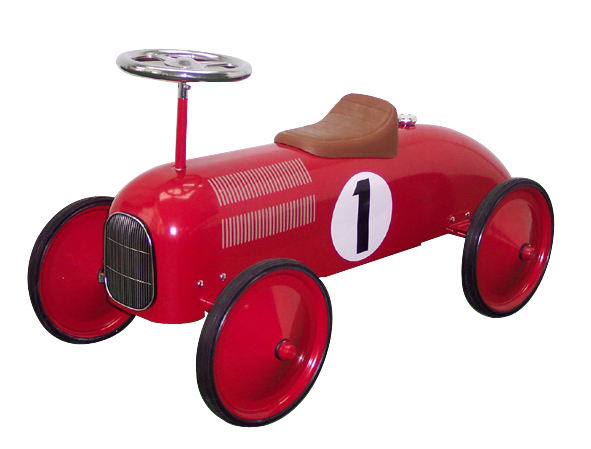 The next step in the growth of C&N was to produce our own designs of pedal cars, and have them made for us overseas. We now have several cars that are our exclusive designs we have grown to be one of the largest distributors of all steel pedal cars. Another area that we are excited about is making a kit available so you can build your own pedal car. We supply the mechanical parts like the frame, wheels, and steering mechanism, and you use our plans to build a wood body from plywood that you can buy locally. Whether you are looking for parts to restore an old pedal car, or to buy a shiny new car, or to build one yourself, we are here to help.